This post brought to you by NABISCO Cookies and Crackers. The content and opinions expressed below are that of Katie’s Cucina. The holidays have arrived, and if your like me you entertain a lot. With entertaining comes easy appetizers and quick desserts. 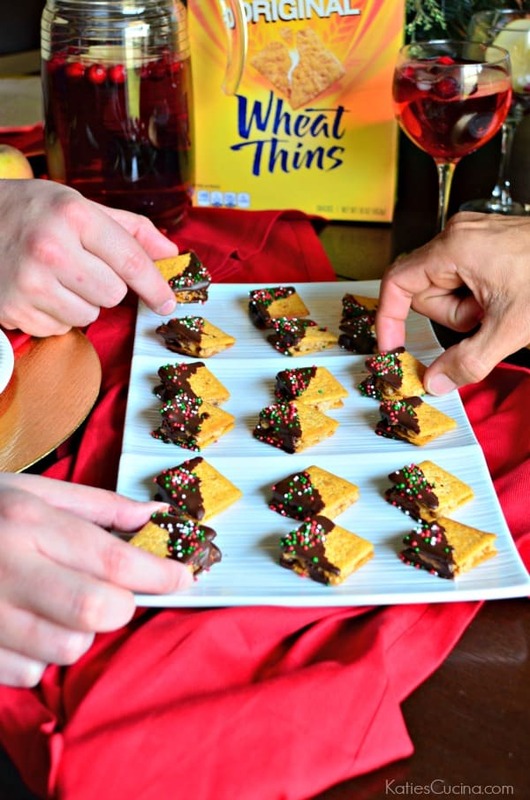 This recipe for Wheat Thins PB Chocolate Bites are perfect for holiday entertaining! If you love peanut butter and you love chocolate then these bites are for you. My guest loved the Wheat Thins PB Chocolate Bites. They loved the crunch and commented on how pretty they looked! 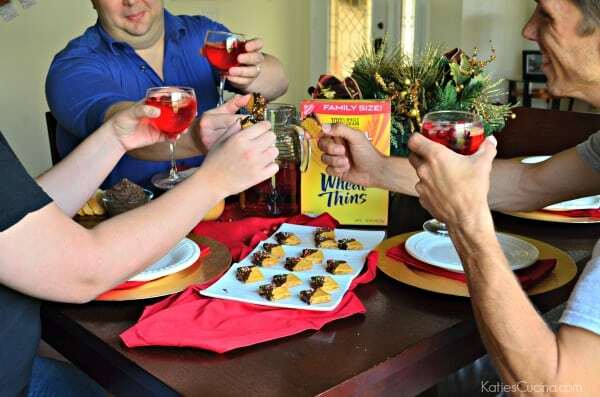 Planning a party can be stressful but thanks to my friends from NABISCO they have helped take the stress out of party planning this holiday season! Here are a few tips to help make your holiday party a success! Invite guest via digital invite and paper invite. That way they have two reminders! Create a signature drink for the party. I love sangria’s! Pictured is my Cranberry Apple Sangria–festive for the holidays! Have your table set before your guest arrive. Enjoy as much time as possible with your guest and as little time as possible in the kitchen! 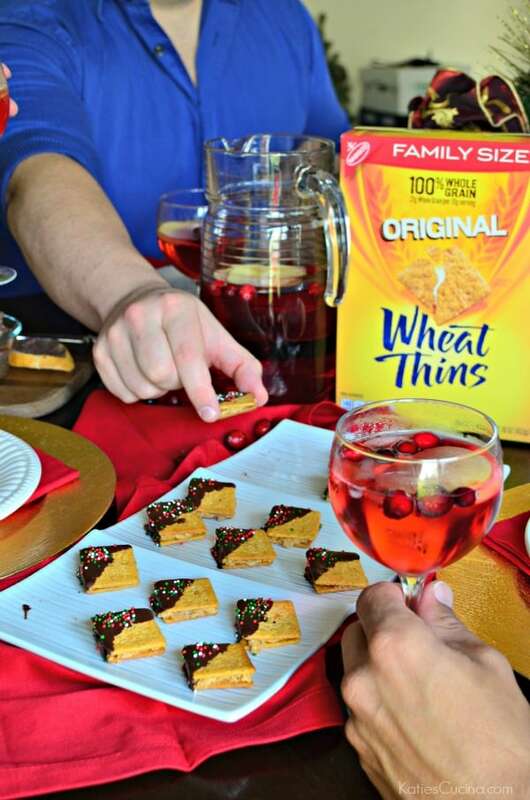 No matter what the size of your party this holiday season. 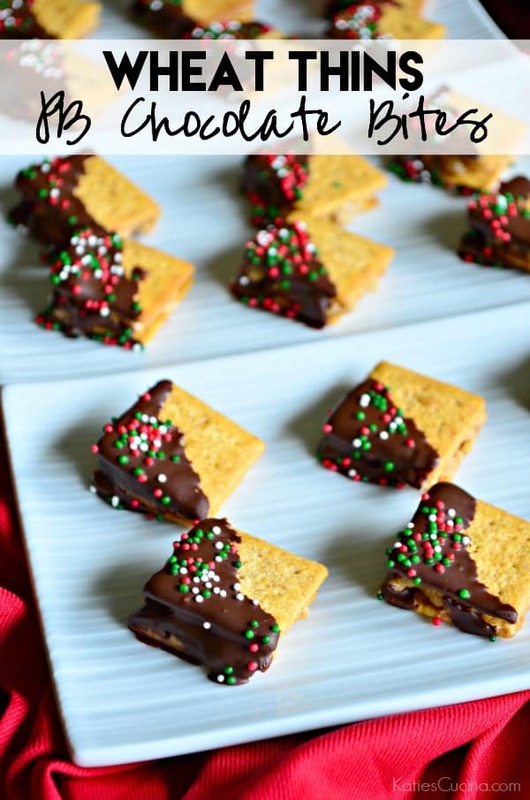 I hope that with my tips and this recipe for Wheat Thins PB Chocolate Bites that your a little better prepared to be the hostess with the mosses! 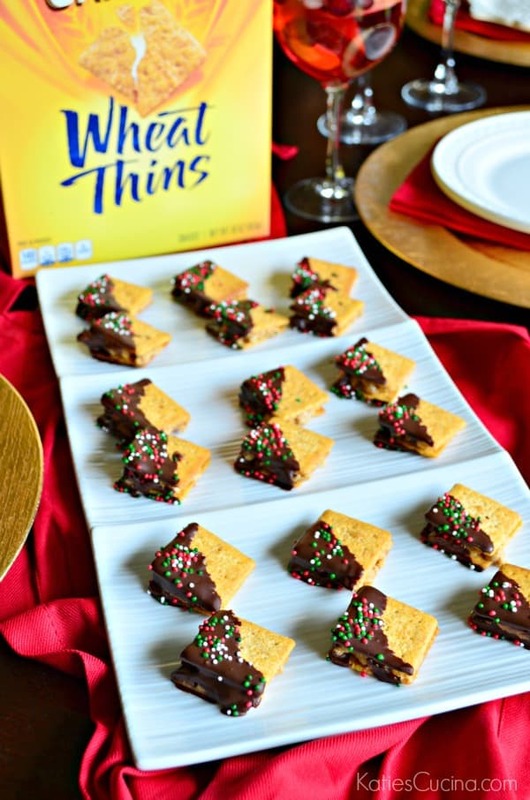 Make sure you visit the Nabisco Party Planner, where you can find more themed holiday recipes from NABISCO as well as coupons savings at Publix. Crush 36 WHEAT THINS finely; place in medium bowl. Add peanut butter and sugar;beat with mixer until blended. Stir in cereal. Spread 36 of the remaining WHEAT THINS with peanut butter mixture; cover with raining WHEAT THINS to make sandwiches, gently pressing WHEAT THINS into peanut butter mixture to secure. Is late here and was just about to shut down, saw your recipe! Oh my, nostalgic big time! Back in 1986,had just my first 2 of my 4babies,as well as an entirely different husband and family.YIKES!In a good way. My ex mother in law was and is such a sweetheart. YA know one misses the extended family so much in a divorce.So sad. Anyway,2 babies under 3,strapped money wise, but life was so simple and good. Marie, made these treats. Yours, are fancier,well cuz foodies have that creative thing and all. Were sooo good. She said all she did was put peanut butter between 2crackers,dip in chocolate.Now your recipe, amps it up.HAVE to make these now! Thanks so much for the recipe. Awe Teri thank you for sharing. Glad that this recipe brought back memories!